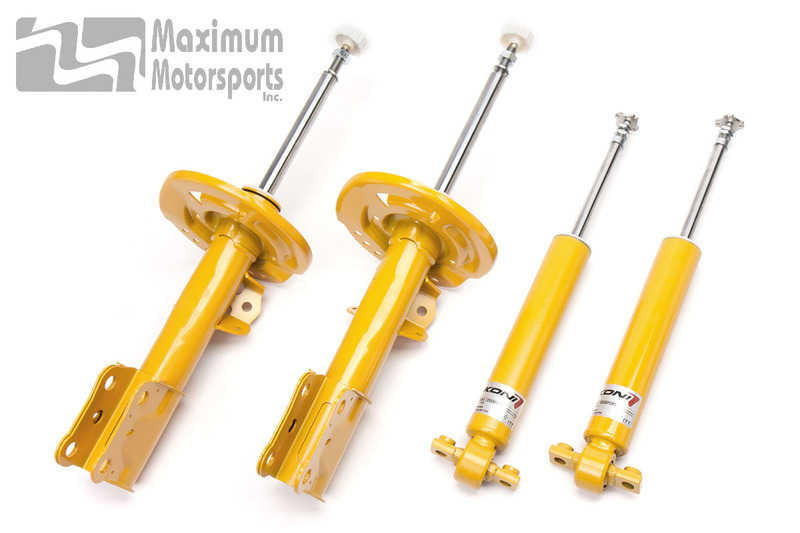 Set of 4 (2 struts and 2 shocks) Koni Sport Single-Adjustable dampers for 2015 and newer Mustangs. Adjustable Koni Sport series dampers are tuned to bring the S550 Mustang's suspension to a higher level of performance. External rebound adjustment allows optimizing the damping for stock OEM springs as well as for aftermarket lowering and performance springs. Wide adjustment range of the Koni Sport series matches well with both stock springs and aftermarket performance springs. 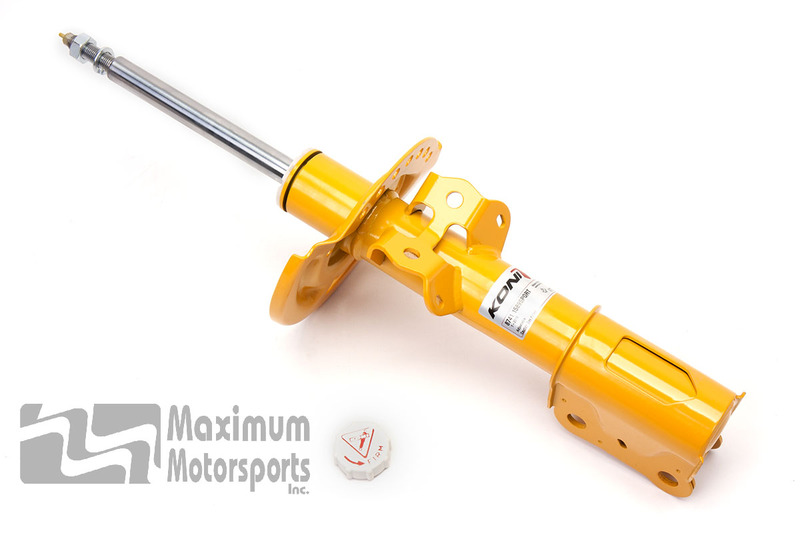 Replacement for stock struts and shocks; requires minor modification to OEM rear upper shock mounting bracket. Rebound valving is easily adjusted by rotating a knob at the top of the strut or shock. Does NOT fit GT350 or GT350R. The Koni rear shock requires enlarging the hole in the stock aluminum upper shock mounting bracket. 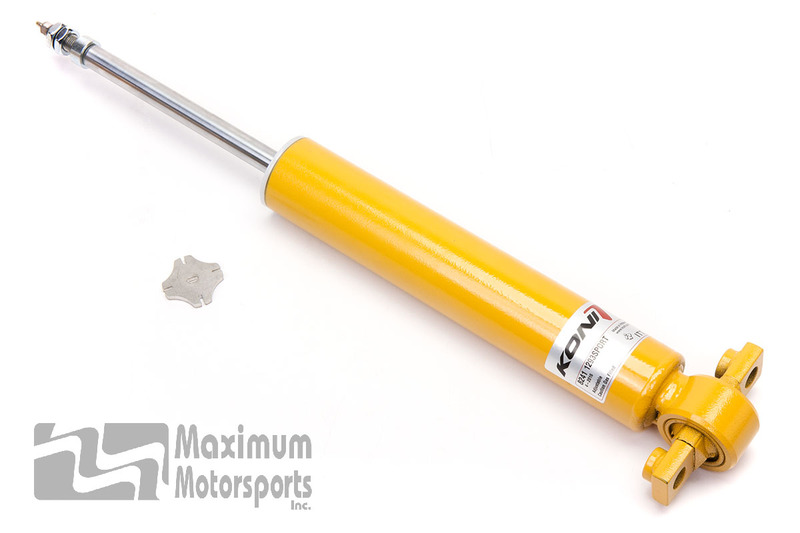 The hole must be drilled out to accommodate the larger diameter shaft of the Koni shock. The Koni shaft is larger than the stock shaft to provide room for the adjuster mechanism. MM has instructions for drilling. The Koni rear shock requires enlarging the hole in the stock aluminum upper shock mounting bracket to accommodate the larger diameter shaft of the Koni shock. MM has instructions for drilling. How do I adjust Koni dampers? Rotate the knob (supplied by Koni with the dampers). Where do I want to set the adjustment? It requires some experimentation to optimize the settings for your particular Mustang with its springs and your preferred handling and ride quality. If adjusted too soft, your Mustang will feel floaty, especially at freeway and higher speeds. If adjusted too stiff, the ride quality will be extremely harsh. Experiment to find your personal happy spot that's not too soft, and not too harsh.